You guy's may received that message "you have run out of space for your gmail account". 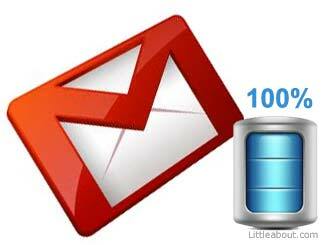 This means that space allowed by gmail service is completely used and you have to find space to to store new emails. At beginning stage of gmail it was given 1GB of inbox space which was hundred times larger than space provided by other email service providers. But nowadays many users ran out of their gmail inbox space quickly as they receive high quality video clips, pictures, PDF and other kind of data through email forwarding. Here's some tips to get rid of the error message from google and continue to enjoy gmail services. 2. Delete unwanted email messages from inbox and trash. As you are a normal user, second method is more convinient. Unfortunately gmail does not provide any facility to filter out the larger emails and we have to find ourselves and delete the bigger emails in town. There's a free service utility out there called Find Big Email. This website can filter out the emails having larger files. So it can be found from our inbox by search and deleted. Please to be noted that, it may take some time to process the request according to number of emails in your inbox. Use JPEG format instead of tiff (.tiff) and .raw to reduce file size of pictures taken from digital camera. Set JPEG quality 7 to reduce size and optimum quality. To do this we can use Picassa or Photoshop software..
Save word, open office document formats in .rtf instead of using .doc to save space.